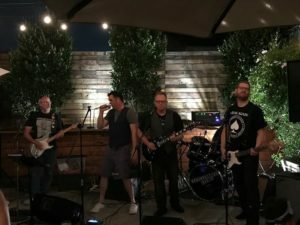 Huge, huge thanks to all of you who came out to this past weekend’s show at Helix Brewing Company in La Mesa. It was our first time there, and what a night! We know from experience how beautiful the setting is, with greenery all over, cozy yet expansive seating, and cool, vibey lighting. We’re also pretty familiar with the beer, which treated us right. But the biggest factor was the people. We saw and chatted with friends old and new, including a number of people who just happened upon our brand of classic alternative music and stuck around for a drink or three. We were also flattered to have friends from some of San Diego’s finest and coolest bands swing by. It was great (and a little intimidating) to see friends from bands such as Manganista, Stones ‘N Roses, and San Diego Music Award nominees Big Bad Buffalo. It reminded us of just how much seeing live music feeds the spirit. So make sure to go out and support live music tonight! We hope to be back at Helix soon and build on this show. And speaking of shows and soon (clumsy segue alert), we’ve got a couple more shows on the books. One is another first time venue, at Saddle Bar in Solana Beach, on Thursday, July 13th. Then there’s our return engagement to Mr. Peabody’s in Encinitas on Saturday, September 16th, which is bound to be a happening. Many thanks for coming to see us, bringing your friends, and taking part in the fun of classic alternative music.